Our Fitted Printed Tablecloth will perfectly fit a 6ft trestle table 1838mm (l) x 763mm (w) x 745mm (h) with no overhanging, excess fabric. Call us today for custom sizes. Our Fitted Custom Printed Tablecloths are designed to fit your tables with no overhanging, excess fabric. Fully branded to include your logo and pantone reference colours, these tablecloths can transform your table top display to attract attention all day long. 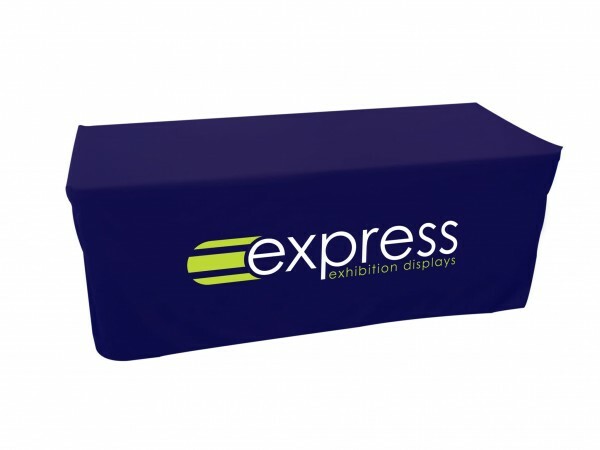 Express Exhibition Displays’ printed tablecloths are printed using a dye sublimation process to ensure your logo doesn’t crack or fade over time. Have we mentioned you can also wash and iron our tablecloths? Use a cool wash setting on your tablecloth and they’ll be looking as good as new for longer! Our standard size, 3250mm (w) x 2150mm (h), will fit a 6ft trestle table 1838mm (l) x 763mm (w) x 745mm (h). If your table dimensions differ from this, please call us so we can provide you with a custom quote. 1. Place your fitted tablecloth over your table. 2. Pull down over legs to create tension.